This epic contest is said to have started during the reign of Sho Ei (1573-1588). When assembled, the 90-meter rope weighs about five tons. The rope represents a good harvest, and the tug-of-war brings its bounty to the winning team. Highlights of the festival include a parade around the venue in which groups of villagers carry enormous male and female ropes with young performers dressed as Okinawa's legendary figures perched on top. The contest begins after the two groups meet and the ropes are conjoined. The sight of the participants giving it their all is inspiring! The Yonabaru Great Tug-of-War Festival draws a large number of people from across Okinawa each year. In addition to the competition, the festival features live music, a fireworks display and more. The total length of the ropes used for the event is 90 meters and weight is five tons. 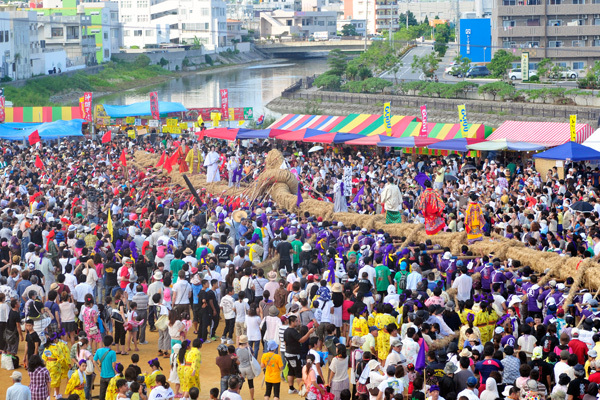 The parade of villagers carrying the giant ropes to the event venue is a unique feature of the Yonabaru Great Tug-of-War festival. As they arrive at the designated point, the villagers suddenly release the ropes, which fall on the ground with a heavy thud..